Club chairman John Carty welcomed everyone to the club Annual General Meeting on Wednesday evening, and thanked them for helping to make it another great year for the club. Our open events were safe and popular, our club runs are going well and some members were also competing very successfully in open races – particularly the Rockett brothers, John Rafferty and Ricky Topping. John also mention two losses during the year – Joyce McIlwrath and Colin Watson – and there was a short silence in their memory. There was a good turnout of 35 members – the highest in recent years. In his secretary’s report, Gareth Murray noted a slight drop in membership to 138. This reflects the wider drop in Cycling Ireland membership, and perhaps reflects concerns from leisure members about the value of CI membership. CI are already looking at how to address this. Gareth highlighted the importance of sponsors who help us to run our big events like the Tour of Ards (Armstrong Auctions), HomeGrownNI (town centre races) and Chain Reaction Cycles. Gareth also thanked all those who had helped out at events this year, including timekeepers and marshals at the club races, club run captains and those who organised trips to Mallorca and Italy. Conn Russell also highlighted the importance of sponsors in his treasurer’s report, and asked any members with links to potential sponsors to contact the committee. Overall, the club was in a healthy position, and it was agreed that membership should remain unchanged (£15 for seniors, £5 for underage and £1 for non-cycling). Club race fees will also remain the same (£2 for seniors, 50p for underage and £3 for visitors). We’ll be publishing more details shortly about how to apply for next year’s licence. In the mean time, if you are making a bank transfer payment to the club, Conn asked if members could set up separate payments for membership and clothing, so that they can be easily distinguished. The club was delighted to raise £2500 at the Tour of Strangford for Cruse Bereavement Care NI and Action Mental Health NI. The club also made donations to the Belgian Project and the PSNI Benevolent Fund, and it was proposed to continue supporting these worthy causes next year. Conn thanked Gavin McBride for managing our clothing orders (the largest item on the balance sheet) and Richard Hanna for auditing the accounts. A number of minor changes were made to the club constitution, as part of working towards registration under the Community Amateur Sports Club (CASC) scheme. 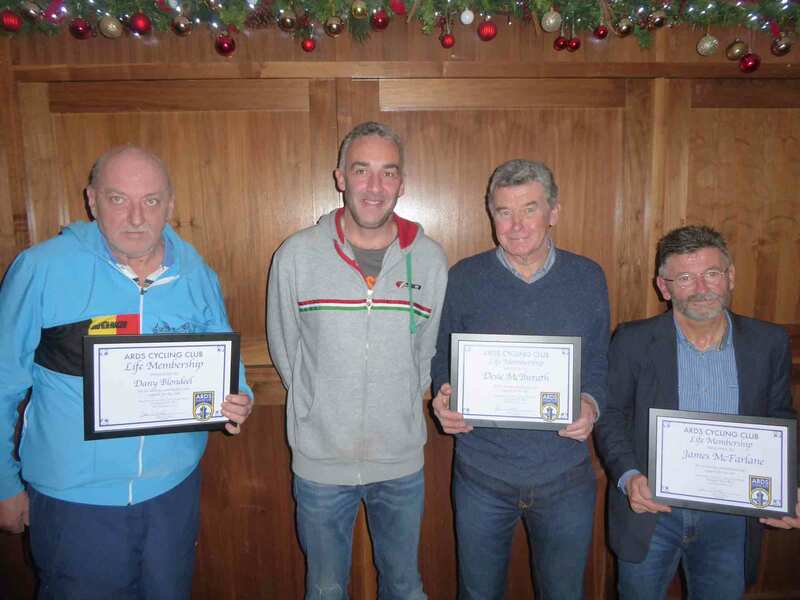 Five members, who had been awarded life membership at the AGM two years ago, where presented with certificates. The five are James McFarlane, Ron Martin, Bobby Magreechan, Desie McIlwrath and Dany Blondeel. 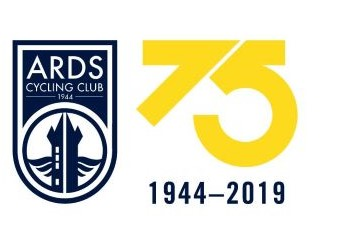 A sub committee has been set up to look at how to celebrate the club’s 75th anniversary next year, and there was a lively discussion about potential ideas. A recent email survey of club members showed that a 75k Sportive, a weekend away and a film show were the most popular ideas, and the meeting debated some options for these. Darren outlined some other events that were already in the pipeline, include a formal event with Sean Kelly on 19th October, and extra events at the town centre races. There was strong support for a woman’s event, and Sean Hardon offered to sponsor it. If you have any other ideas, please contact the committee – they’ll be firming up the plans over the next couple of months. 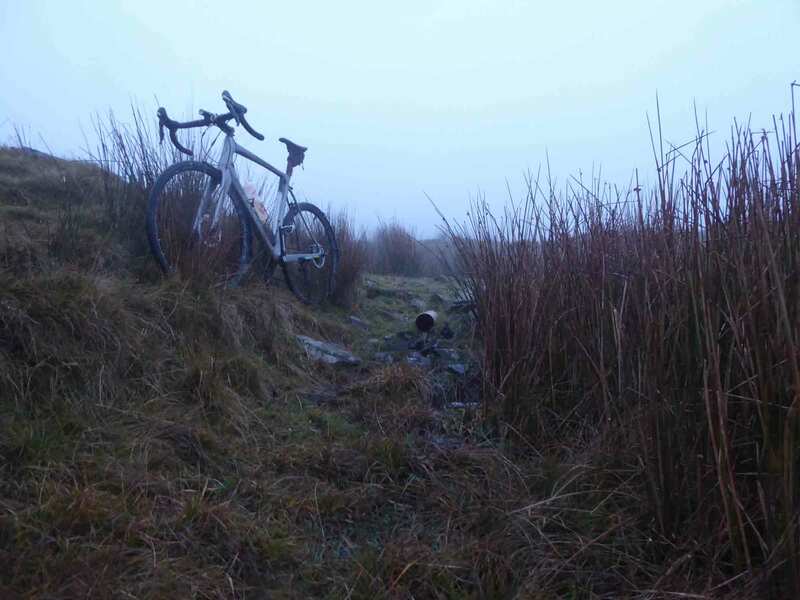 After 75k, could we have found the source of the river Lagan…? Watch this space!